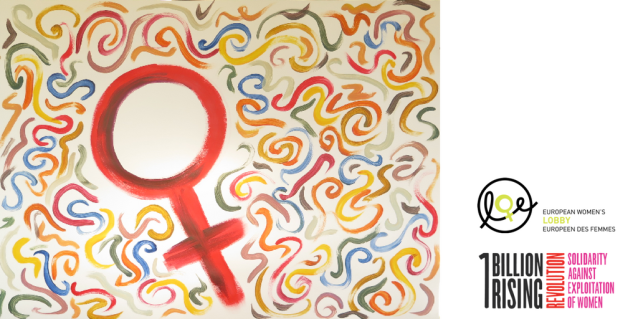 European Women’s Forum is a dynamic five days of feminist activities. 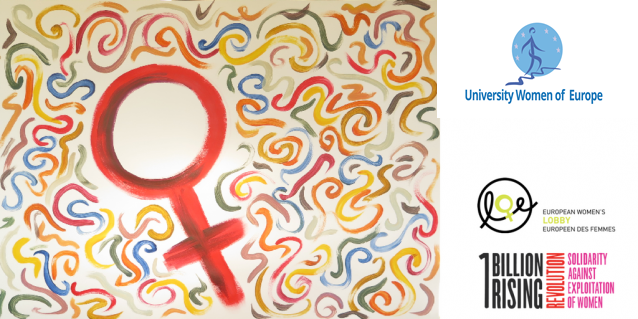 The events of the week, from EWL General Assembly to the public street event “Loud and united to end violence against women and girls” , will be a chance to come together and celebrate the success of the European’s Women’s Movement. This year all documents for EWL General Assembly will ONLY be available through EWL members’ forum, the Living Room (and not sent as attachments). The draft agenda, the applications for EWL candidate Board Members, all the documents for the GA are available on the agenda page, except for the 2017 Emergency Motions paper which will be made available this week. 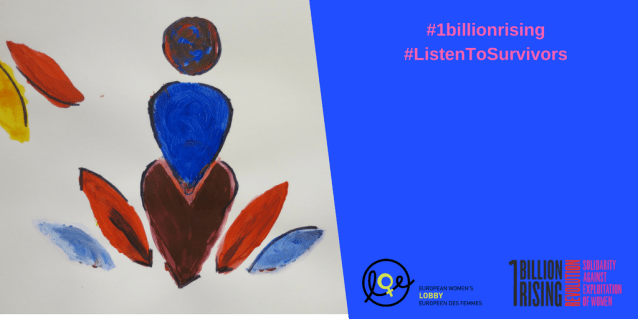 This year, the European Women’s Lobby is marking the 20th anniversary of the establishment of the EWL Observatory on violence against women and girls (VAWG). The Observatory is a unique structure that brings together more than 30 experts, professionals, women’s rights defenders, and front-line NGOs activists, from all over Europe. On 11 May 2017, the EU publicly declared its intention to sign and ratify the Istanbul Convention, the first legally binding treaty in Europe that criminalises different forms of violence against women. With this declaration, the EU sends the world a message about its commitment to fighting the violation of women’s rights. On 8 June, EWL wants to give visibility from Belgium and around Europe to their tireless work and achievements at the forefront of the fight against VAWG. 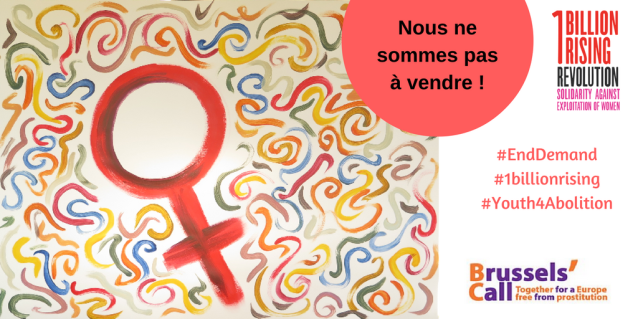 After the demonstration, EWL Members are then getting together with Gloria Steinem for dinner at Brasserie de la Presse from 18.30. This entry was posted in EWL, Uncategorized and tagged European Women's Forum 2017, European Women's Lobby, EWL Observatory on violence against women, Gloria Steinem, Loud and United, violence against women and girls. Like every year, the European Women’s Lobby (EWL) will take part to the 61st session of the UN Commission on the Status of Women (13-24 March). EWL membership is very active during CSW61, organising side events and influencing the negotiations on the Conclusions which should be adopted by the UN member states at the end of the session. This year’s priority theme is “Women’s economic empowerment in the changing world of work” and the emerging issue is ’The empowerment of Indigenous women”. Ahead of CSW61, the EWL had sent, together with its members, a joint statement highlighting the situation of women domestic workers. We have also made comments on the zero draft of the conclusions. 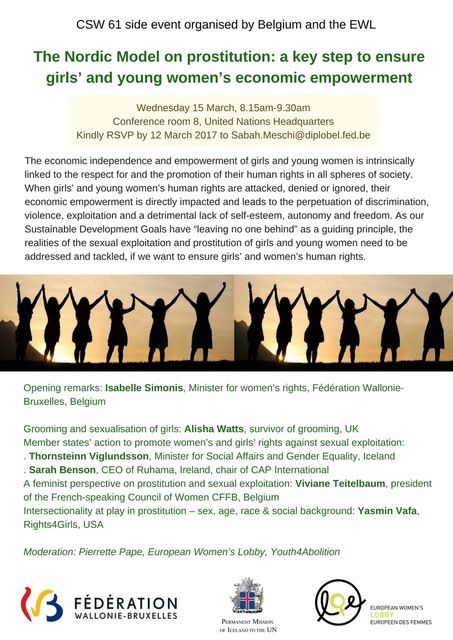 A side event co-organised with Belgium and Iceland, on “The Nordic Model on prostitution: a key step to ensure girls’ and young women’s economic empowerment”, on Wednesday 15 March, 8.15-9.30am, in conference room 8 of the UN. 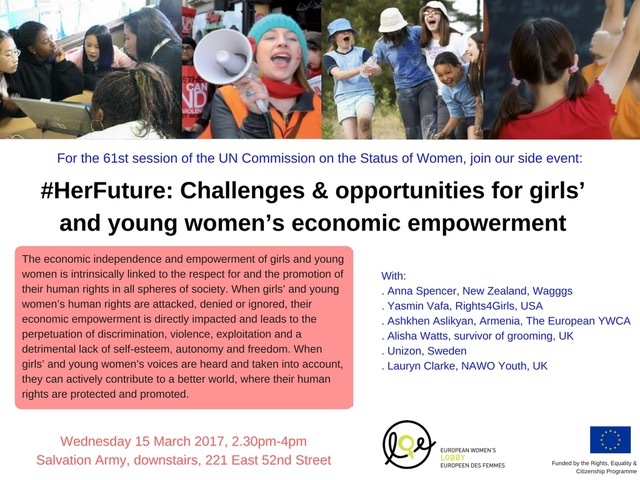 A parallel event co-sponsored by NAWO Youth, Unizon, Wagggs, the European YWCA and Rights4Girls, on “#HerFuture: Challenges & opportunities for girls’ and young women’s economic empowerment”, on Wednesday 15 March, 2.30-4pm, at the Salvation Army (downstairs). NAWO (UK) organises a series of events, to be soon on their dedicated webpage. The list of NGO events is here. The list of official side events is here. This entry was posted in EWL and tagged CSW61, European Women's Lobby, UN Commission on the Status of Women. 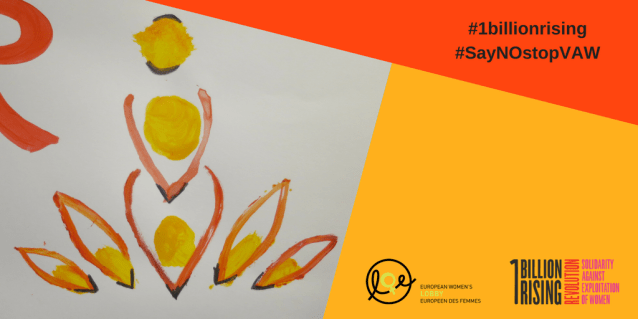 On Tuesday 14 February, University Women of Europe together with the European Women Lobby (EWL) and other members from all over Europe will be rising to say no to the sexual exploitation of women and girls ! 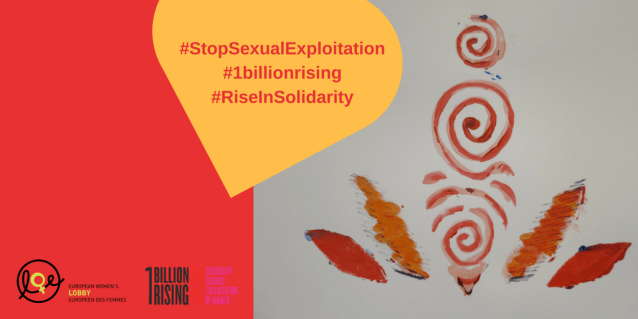 The 5th edition of One Billion Rising will be an opportunity to express our demands to see a world free from sexual exploitation and prostitution, from male violence and oppression. We will rise everywhere, through different actions: dance, demonstration, events… The EWL will launch a social media action, with strong messages on home-made visuals!! A way to celebrate women’s creativity, strength solidarity and togetherness! EWL social media messages are based on visuals created by EWL staff members during an artistic workshop held in Brussels. Please download them below and share them on facebook on Tuesday 14 February, using the hashtags #1BillionRising, #RiseInSolidarity, #EndDemand, #ListenToSurvivors, #Youth4Abolition, #StopSexualExploitation. Please share them with your members, so that they can use them too. Some are in French too, regardez bien! You have a lot of choice, between different messages, colours, visuals, creativity! Please let us know what you plan to do for One Billion Rising: send us some photos, some webpages links, some description. 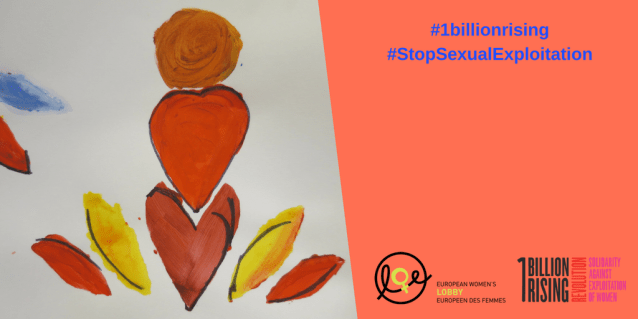 We need to inform V-Day of the European mobilization, and show how we take action to end the sexual exploitation of women & girls! Download and use the following visuals! As you can see, some have free space for you to add your messages and/or logo. Some have the logo of the Brussels’ Call, the European coalition campaigning for the Nordic Model on prostitution. So use the visuals according to what best suits you, whether or not you are a member of the Brussels’ Call and/or Youth4Abolition, whether you prefer to create your own messages. Some are in French too! This entry was posted in EWL and tagged 1 Billion Rising, sexual exploitation of women and girls, StopSexualExploitation, Youth4Abolition. Registration via this link before January 27. This entry was posted in EWL. The situation in Turkey is getting worse. Recently 11 MP’s/leaders of the Kurdish Party (HDP) were arrested, the Democratic Party of the Peoples (HDP) announced the suspension of parliamentary activities on behalf of their party. The state of emergency continues and every day there is another statutory decree which bypasses the constitution. The societal polarization is huge. 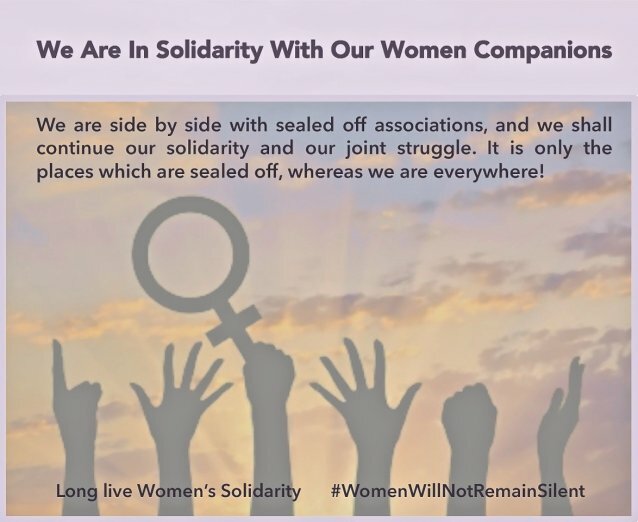 The Women’s Coalition in Turkey (an independent women’s platform which is very closely linked to the EWL Coordination for Turkey), recently made this statement and calls for solidarity for all the women in Turkey. 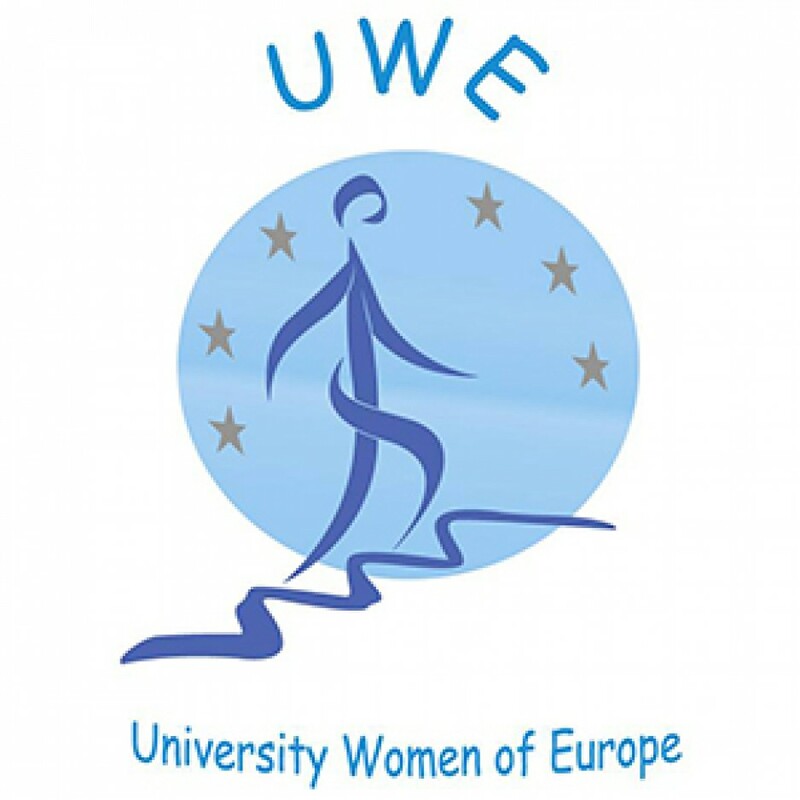 University Women of Europe together with EWL strongly supports the Women’s Coalition and calls on all its members and friends to do so. We will follow up the situation closely. This entry was posted in EWL and tagged EWL, The Women’s Coalition in Turkey. The European Women’s Lobby (EWL) Observatory on violence against women was established in 1997, two years after the adoption of the Beijing Declaration and Platform for Action in 1995, when the states committed to take action to combat violence against women. Having identified violence against women as one of their top priorities, the EWL members decided to create this unique structure to put strengthened political pressure towards ending violence against women. The EWL Observatory plays a key role in identifying burning issues and monitoring progress towards a Europe free from male violence against women. 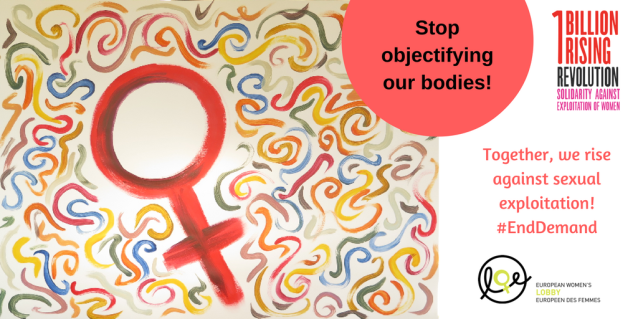 The Observatory is composed by a dynamic group of women who have extensive expertise and experience in the area of violence against women, coming from different countries in Europe1 and who are appointed by the European Women’s Lobby members. 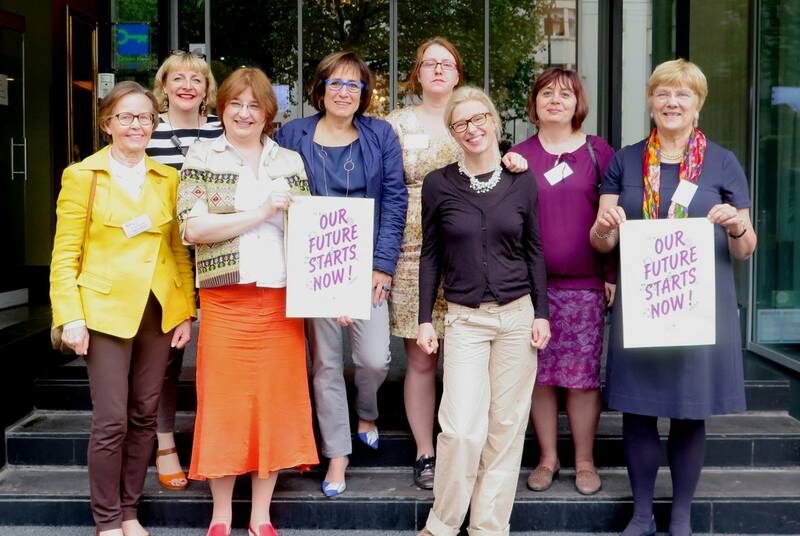 This extensive and Pan-European expertise and experience has been instrumental for the European Women’s Lobby to design its advocacy and policy activities on the basis of a comprehensive understanding of the situation in Europe regarding the different types of male violence against women (VAW), and the challenges and opportunities that women and women’s organisations face. 1 Member States of the European Union, the European Economic Area countries, countries in the formal process of accession to the European Union and neighboring countries. The work of the EWL Observatory on violence against women is in line with the EWL Charter of Principles on violence against women2 adopted in 2007, reiterated in EWL 2016 fact sheet on violence against women3, and with the EWL Position paper “European Women’s Lobby Position Paper: Towards a Europe Free from All Forms of Male Violence against Women” 4 adopted in 2010. 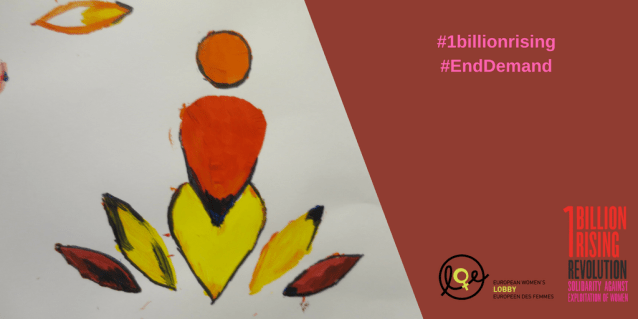 Support the EWL to gather information, trends and burning issues on the prevalence of different types of violence against women, bringing information about the reality on the ground, in order to support EWL advocacy work on ending VAW. Identify gaps in legislation, policy and practice in the provision of services to prevent VAW and protect its victims; inform the EWL about the situation on the ground and make proposals as how to address them. Provide a feminist space for sharing knowledge and information, promoting networking, connectivity and solidarity. It also aims to provide the opportunity for its members to exchange best practices, connect with each other and create links and bridge with regional initiatives. Recognised experts on the overall issue of violence against women and/or a specific form of violence in their country (researchers, legal experts, lobbyists, activists, etc.) with connections or links with front-line NGOs working on VAW. Representatives from a front-line NGO providing services to protect women victims of violence or developing activities to prevent violence against women. An Expert shall be appointed to the EWL Observatory on violence against women for three years. An expert may be re nominated and appointed for a further three years. An expert may not belong to the EWL Observatory on violence against women for more than 6 years continuously. Advise and inform the Observatory on policy issues, good practices, current situation and developments in the field of violence against women, including legislative proposals, new publications, research, etc. Actively share and engage in the exchange of good practices and technical capacity (disseminating information) on VAW amongst women’s NGOs working in the field. Identify and relate on VAW critical and emerging issues, gaps in policy provision, and make proposals on how these could be addressed, including the development of tools for monitoring and mainstreaming VAW at national, EU level and European level. Fulfill work requirements, in writing when necessary, according to the annual work plans of the EWL Observatory on VAW. Take active part in the virtual work of the EWL Observatory as well as in the meetings of the EWL Observatory on violence against women. Contribute to the agenda setting of the EWL Observatory meetings on VAW and facilitate sessions when agreed. 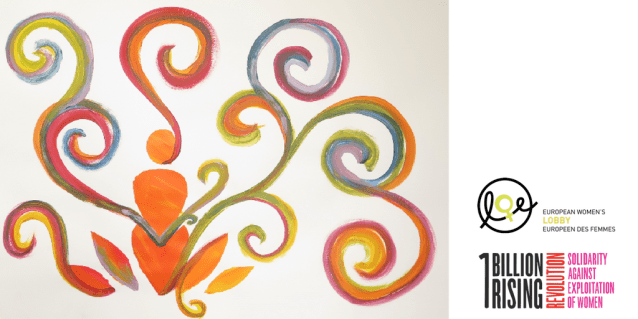 Contribute to the EWL communication tools (web articles, social media, etc. ), in concertation with the EWL national coordination and/or European member. Actively disseminate the work of the EWL Observatory on VAW in different for a at national level and/or regional and international level. Actively identify funding opportunities that will serve the EWL Observatory on violence against women to resource its work and meetings. Promote the EWL values and principles on violence against women. Observatory experts are expected to cooperate through long-distance communications tools (mainly through e-mail, and occasionally through Skype and phone) in close cooperation with the EWL Secretariat to develop the duties above mentioned and the work foreseen in the EWL Observatory work plans. The Observatory will periodically agree on a two-year work plan – with annual milestones – that will contribute to the EWL overall work plan on violence against women. The work plans will acknowledge the fact that the experts of the Observatory are taking part in the EWL Observatory on a voluntary basis. Being part of the Observatory requires a certain time commitment that is estimated to be one hour a week during a year. The workload might vary depending on the timetables agreed in the work plans. Furthermore, experts will commit to attend the annual Observatory meeting (if funding available). EWL Observatory experts will not act as representatives of the EWL Observatory nor are they entitled to represent the EWL, unless agreed otherwise with the EWL Board, in coordination with the EWL Secretariat. The experts of the EWL Observatory commit to keep regular communication and take part in at least two annual briefing meetings with the EWL national coordination in their country or their European member organisation and the correspondent EWL Board member (if any). Ahead of the EWL Board meetings, the expert of the Observatory and the Board member (if any) or the EWL focal point for the European member organisations who are not represented in EWL Board, will liaise to ensure proper communication and updates. EWL Observatory experts are accountable to the whole EWL Board and Executive, through the liaison Board/Executive member to the EWL Observatory. The EWL Observatory on violence against women functions according to feminist and ethical principles to ensure that a safe space is created to enable the experts to express themselves freely, even if they are not English native speakers. The EWL Observatory functions mainly through long-distance communications tools: e-mail, Skype or other virtual meeting platforms and phone. When funding is available, an annual meeting of the EWL Observatory against violence is organized by the EWL Secretariat. The position of chair will rotate on a yearly basis. Supported by and in close coordination with the EWL Secretariat, the chair will have the responsibility of chairing the meeting; coordinate the facilitators of the sessions; and coordinate the minutes taking process. The EWL Secretariat, and specifically the Policy and Campaigns Officer working on violence against women, coordinates, supports and manages the overall work of the EWL Observatory. She reports, as required, to the Policy and Campaigns team and to the EWL Board on the Observatory’s work and disseminates the minutes of the EWL Observatory meetings to the full members. Once the minutes are adopted by the EWL Observatory, the EWL Secretariat will disseminate them within a month. The EWL Secretariat informs the Observatory experts of the dates of EWL Board meetings, in order for each expert to fulfil her liaison obligation with her respective Board member or European organisation. When working groups are created, two co-lead facilitators will be identified to coordinate, animate, follow-up and report on the work of each group. The nomination form will be sent to the UWE President and Secretary General uweboard@gmail.com by 31 st July . What is your experience on the issue of violence against women? Please, provide information about an example of a campaign, a project or research on violence against women in which you have participated. What was your role in this project and how did you contributed? Is there a specific form of violence against women in which you have more knowledge/experience? Please, explain. Please explain what is your level of knowledge about the situation in your country in terms of policy developments and service provision in your country or beyond. What does your network looks like? Which are your links/connections with NGOs that work at grassroots level in the field of VAW in your country or beyond? Please, explain. Are you familisarised with the general work of the EWL? Please, explain. Do you agree with all the principles on violence against women of the EWL Charter? Male violence against women is structural, not accidental: it’s a cause and a consequence of inequality between women and men. Women’s rights are human rights! Violence against women and girls is a human rights’ violation. Any action to end violence against women should promote the autonomy and empowerment of all women and girls. Prostitution and trafficking in women constitute violence against women and a fundamental violation of women’s human rights. Women are affected by mane violence in different ways due to their diverse identities Comprehensive strategies should be adopted to ensure inclusion and protection of all women and girls. 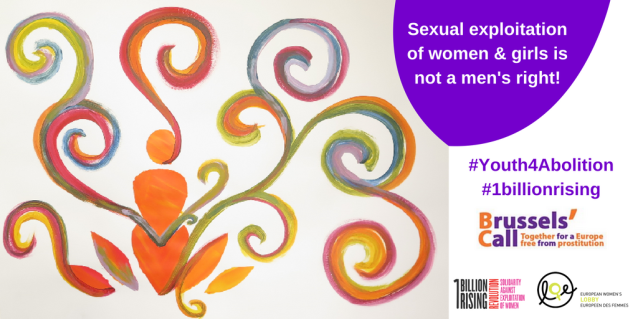 Please read here, EWL Charter of Principles adopted in 2007, reiterated in EWL 2016 factsheet on violence against women, and aligned with the EWL Position paper “Towards a Europe Free from All Forms of Male Violence against Women” adopted in 2010. Yes, I agree with all the principles No, I don’t agree with all of them. Would you commit to support these principles during your mandate as expert of the EWL Observatory on VAW? If you were to speak on behalf of the EWL Observatory on violence against women, would you be able to defend these positions? What do you think that is the added value of the EWL Observatory on violence against woman? How do you think that you can contribute to the work of the EWL Observatory. In what ways are you willing to make a contribution to and share your knowledge with the EWL Observatory on violence against women? In what ways are you willing to regularly engage with the EWL national coordination in your country / or the European EWL member organisation you are related to? This entry was posted in EWL and tagged European Women's Lobby, EWL Observatory, experts of the EWL Observatory on VAW. 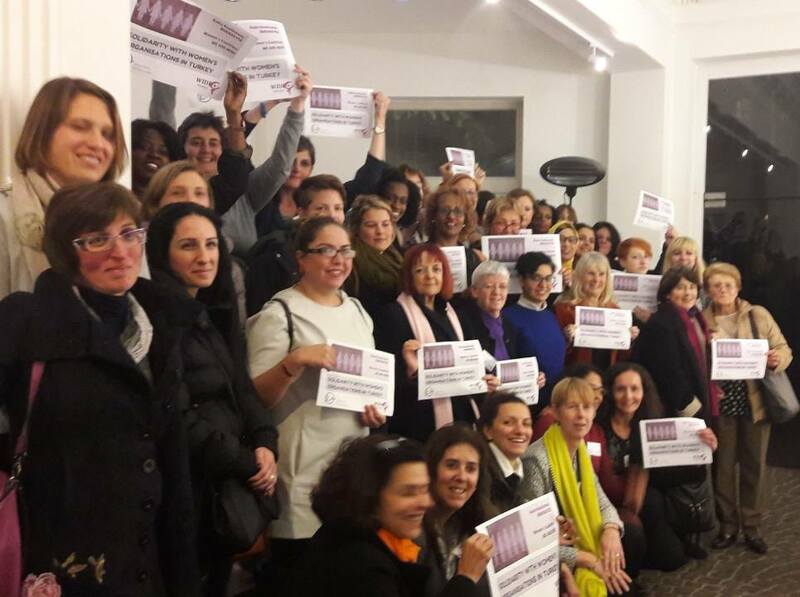 Many EWL members, women’s rights activists from all over Europe, gathered for the EWL Annual General Meeting 2016, during the weekend in Brussels. They talked about the feminist future, austerity, money, gender budgeting, power, work & care and how this all fits into a broad feminist economic model and a gender equal ‪society. UWE was represented by Vicepresident Isabelle Trimaille and Annelise Pierrot – Bults. All country candidates were elected, here you can find LIST OF CANDIDATES TO THE BOARD OF ADMINISTRATION 2016-2018 in each country, if you wish to get in contact. Very proud to see Annelise Pierrot – Bults who’s also willing to be UWE Treasurer in the new board of administration & executive committee 2016-2018. Congratulations to all of them and keep up the good work at EWL! This entry was posted in EWL and tagged Annelise Pierrot Bults, EWL Annual General Meeting 2016, Isabelle Trimaille.